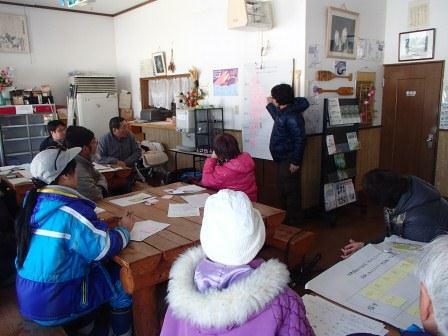 The Winter Eco-Tour 2016 for local residents was held on January 30, 2016, to mark the annual World Wetlands Day (February 2). During the event’s fieldwork and at a workshop held at Kushiro-shitsugen (Kushiro Wetland) and Lake Toro, KIWC Technical Committee Chair Mr. Hisashi Shinsho provided commentary on ideas including how the blessings of wetlands can be preserved for future generations in order to enrich people’s lives in line with this year’s theme of Wetlands for our Future: Sustainable Livelihoods. Participants started the eco-tour near Lake Toro, where they created bark rubbings on paper to highlight differences between textures and other variations. They then trekked over the snow-covered Lake Toro and observed frost flowers, animal footprints and pond smelt in the lake. The walk kept the group warm on this very chilly day, when morning temperatures fell below minus 20 degrees Celsius, and was followed by a meal of deep-fried local pond smelt (a blessing of the wetland) provided by local outdoor pursuits company Lakeside Toro. 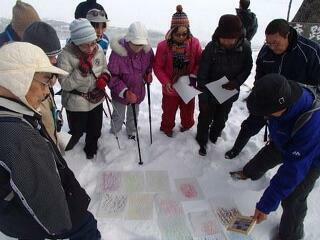 At an afternoon treasure hunt workshop, attendees learned about eco-tours and treasure hunting in nature. The earnest and lively discussions helped to highlight local treasures related to the wetland, and attendees planned eco-tours by which these resources can be leveraged for community revitalization. Inspired by their wetland fun, related films and other stimuli, the group came up with various ideas in the workshop’s lively atmosphere for eco-tours that would promote the conservation and wise use of wetlands as well as community revitalization.